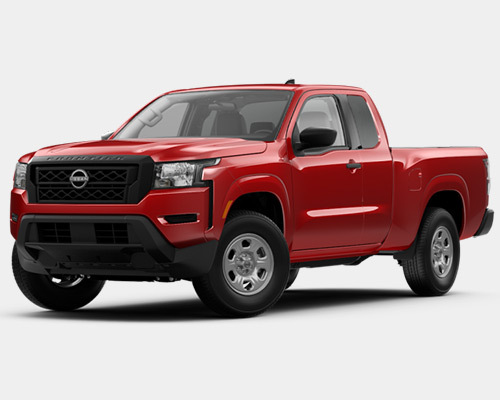 Designed with the hardest workers across Orlando in mind, the latest Frontier from Nissan is all about upgrading your time spent on and off the clock. Ensuring you always have plenty to love about this flagship member of the Nissan family, Frontier comes loaded with ample amounts of tech, luxury, and work-ready inclusions. Now that your curiosity is piqued, follow along as the Universal Nissan team explains exactly why buying or leasing one of our Nissan Frontiers is always a smart call. Nissan Frontier is a truck that never backs down from a challenge. Of course, when you have access to a 2.5-liter (L) four-cylinder engine capable of 152 horsepower (hp), 171 pound-feet (lb.-ft.) of torque, and 19 miles per gallon (mpg) in the city and 23 mpg on the highway, as well as a 4.0-L V6 that clocks in with the potential to two up to 6,720 pounds (lbs.) (261 hp and 218 lb.-ft. of torque), backing up these bold words is no problem. When the going gets tough, don't you want this kind of workhorse on your side? Why should you stop exploring just because you are outside of Orlando limits? By equipping your Frontier with some of Nissan's finest available off-roading features, including the Active Brake Limited Slip system, selectable drive modes (4WD High/4WD Low/etc. ), and an electronic locking rear differential, you can conquer even the toughest of terrain. For Orlando explores who cannot wait to venture off the beaten path, owning or leasing a Frontier from Universal Nissan is clearly a no-brainer. No mountain can stand in your way with the power of Hill Start Assist and Hill Descent Control features on your side. First up, Hill Start Assist holds brake pressure for a few seconds as you switch over to the gas, thereby ensuring you never start rolling backwards. From here, Hill Descent Control maintains speed and brake pressure with the push of a button to make certain you have a controlled, smooth descent on a steep decline. Available in crew, king, and crew cab long bed cabin types, Frontier S is a workhorse that is second to none. Once you add in access to Nissan's RearView Monitor, a seven-inch (in.) touchscreen display, and countless other premium features, once thing becomes clear in a hurry: Tackling tough jobs and having fun while you do it has never been easier with a Nissan Frontier S on your side. Stylish and powerful, the Nissan Frontier SV is ready to upgrade your daily commute here in Orlando. This class leader, which is offered in both four- and six-cylinder versions, comes with access to a Rear Sonar System, sliding bed extender, and even heated front seats. 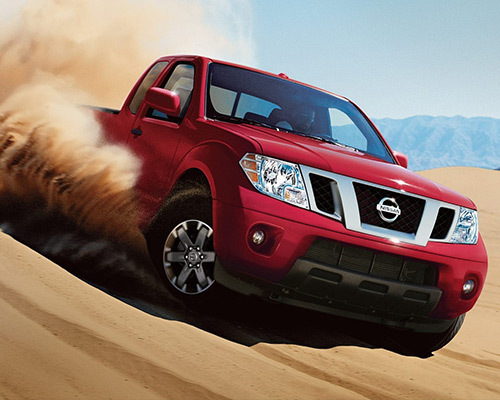 No terrain is left unexplored once you are behind the wheel of a Nissan Frontier Desert Runner. Of course, when you are packing Bilstein off-road performance shock absorbers, fog lights, a spray-in bedliner, and numerous other high-end off-road upgrades, backing up these bold claims just becomes par for the course for Desert Runner. Keeping you and your passengers comfortable, all while ensuring you have plenty of storage space, is a prime focus of the Nissan Frontiers currently offered for sale or lease here at Universal Nissan. From a multi-level center console to a dual-level glove compartment, there is no shortage of handy spots to store your valuables. Once you factor in optional under-seat storage trays, it is easy to see this pickup definitely means business on this front. Today's driver needs to stay connected with the Internet if he or she plans on keeping up with the modern world. Fortunately, Nissan Frontier is more than prepared to rise to the occasion on this front. From access to Siri Eyes Free and voice-controlled navigation to hands-free Bluetooth calling, you can stay in touch with the digital landscape, all while keeping your eyes on the road. With the available premium audio system from Rockford Fosgate in your Nissan Frontier, enjoying the finest sound quality on the roads of Orlando has never been easier. Featuring ten speakers, this upgraded inclusion ensures you always have the perfect song playing as you and your friends take to the highway. Having access to music from countless different media sources is also included when you pair this audio system with SiriusXM Radio and USB and auxiliary jacks. With these features leading the way, it is beyond obvious that Nissan takes your safety on the roads of Orlando very seriously. When paired with everything else you have learned here, it should not be long before we are greeting you as you walk through our front doors and helping you learn even more about how this impressive pickup can upgrade your daily routine.